Bill Hardman sent this copy of a POW correspondence card from Obergefreiter Josef Dagner. 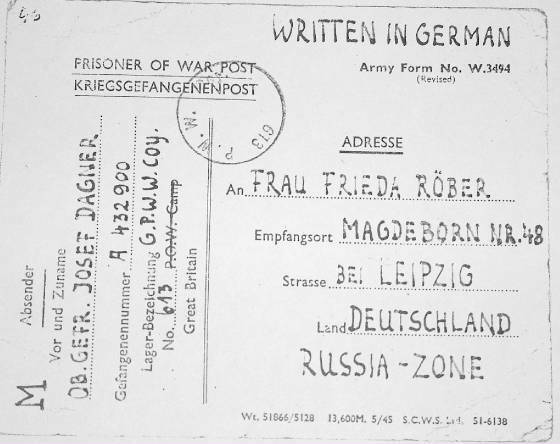 Joe sent a few letter cards to Frau Roeber in Magdeborn from other camps and it's interesting to see how the address changed. At the time of the first one she lived in Adolf Hitler Strasse (every town and village had one). The one from Blackbeck doesn't show a street at all and by the time of the last one it was Marx-Engels Strasse (the Red Army having arrived). Magdeborn itself was compulsorily evacuated by the East German Government in the 1970's to make a large dam and reservoir. Dagner, who was a Marine Gunner, was captured in the Pas de Calais by Canadian troops in September 1944. He worked on the huge guns which fired across the Channel and we believe he was stationed at the Batterie Todt near Cap Gris Nez which is now a museum. My friend's father was killed on a U-Boat at Koenigsberg and his widow and her son (then 3 years old) managed to escape Koenigsberg just before the Russian occupation of East Prussia and ended up in Regensburg. His mother became acquainted with Joe Dagner through a POW correspondence and she and the boy moved to England to join him in 1948. Joe worked on various farms around the country and died in his 70's in the late 1970's. Joe never went back to Germany - although born in Bavaria, his family and connections were in the Leipzig area which ended up in the Russian zone, latterly the DDR. I was amazed when I realised GWCC 613 had been at Stainton. It puts more of a human face on things when there's a connection with an actual inmate. It would be nice if any of the former British staff turned up (on November 1st). We think the pictures were all taken in France. He was put on a ship for transport to Canada but the ship was torpedoed (by a German U-Boat!) off the coast of Northern Ireland and survivors were landed there. He never went to Canada and ended up in British POW camps instead. The card from Stainton (GWC 613) is not dated but was probably one of his last camps before release. Many thanks to Bill Hardman who supplied the photographs and wrote the text used on this page. I was stationed at Barnard Castle in the then Durham County Constabulary between 1966 and 1970. Barford Camp was occupied by 47 Regt. Royal Artillery, and Deerbolt by 49 Regiment. 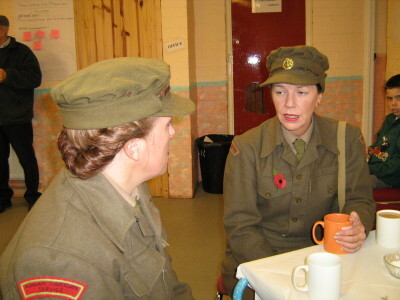 There was an RMP Detachment at Streatlam and an Army Air Corps. Stainton Camp was 'mothballed' but used occasionally as transient accommodation for Regiments temporarily withdrawn from BAOR. Stainton Grove was fully occupied as Married Quarters. There was no public transport from there into Barnard Castle and no facilities on the estate. I always felt sorry for the young women pushing prams up that hill to go and do some shopping. I transferred to Hertfordshire Police in 1973 and have stayed down here ever since - retired in 1995.